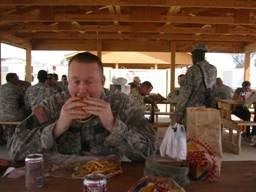 When Lincoln first approached us and asked us to write an exclusive about the hamburgers of Iraq I was stoked. I mean, the opportunity, right? To work with Lincoln and go on assignment! At first I was a little hesitant due to the situation there – who would be able to find hamburgers in a war torn country? And if there were hamburgers, how good could they be? We were up to the challenge and were hungry, so with Lincoln’s promise of being reimbursed for the burgers we headed to the local recruiters office to see about getting a ride to Iraq. Fortunately they were in a good mood as well and even offered to pick up the tab for our flight over, give us three hot meals a day and a nice cot at night. We were in heaven. I grabbed my Buddy Captain Renegade and took off for the food court as soon as our possible (of course it took 9 months and a FOB change before we came to one that had a burger joint). Here you can see the “King of Iraq” in the background waiting for our arrival in full, air conditioned trailer regalia. Notice the well displayed menu board with 3 burger options (1patty, 2 buns pieces, 2patty, 2 buns, & 2patties 3 buns). The gravel seen here is typical – we seemed to have coated the entire country in 6-12 inches of the stuff (although when it rains it keeps the clayey mud off our boots). WaterBoy: Hi, How are you today? WaterBoy: Yeah, sounds good, nice day huh? WaterBoy: Yep, make it a meal deal! TCN: OK! [smiling now that I am talking his language] Coke OK? Renegade’s Conversation is similar except he usually goes for the 2:2 (Patty:Bun) burger. The wait is about 5 seconds and makes us both ecstatic. It is the only thing that happens fast in this country and we are glad the US has made an impact in Frozen food preparation and hot grill and fryer instant gratification. WaterBoy, taken his time goes for a mixed approach (notice the hungry, squirrelly looking guy behind me trying to sniff my burger!). All in all a memorable experience. 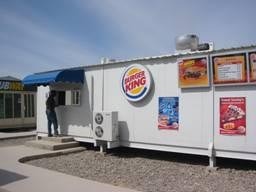 If you are ever in Iraq and want to join us for a burger. Give us a call!